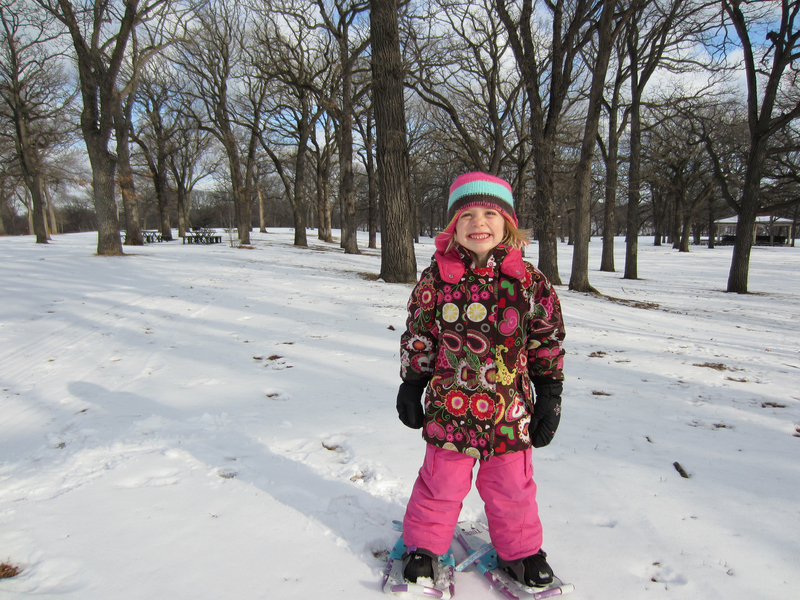 Yesterday was a gorgeous winter day here in Minneapolis. The sun was shining brightly, launching its powerful, magical rays across the glittering white snow-packed ground. The birds were chirping cheerfully and it was unseasonably warm. Almost 40 degrees F which is considered balmy in Minnesota (if it is above 20 in January or February, we are considered lucky). It was the first morning in a long time that I woke up and literally sprang out of bed to the call of my children greeting me “Mama. Mama. Maaaaaaa-maaaa!” I instantly opened their bedroom shades and jumped with joy. Yeah! The sun is here! I was so happy to see my long lost friend. My kids thought I was a bit crazy but they don’t understand my need for sunshine and vitamin D. It is said that most people living in northern climates are highly insufficient of vitamin D in the winter months. This can lead to intense fatigue (check), lethargic behavior (check) and sometimes depression (hmm….I have been feeling a bit blue). In winter months, our days are short and the nights are long. Although it can be quite sunny in the winter, the sunshine often brings bitter cold forcing you to hibernate and be trapped inside your home staring longingly outside your window wishing for spring. Yesterday was different. 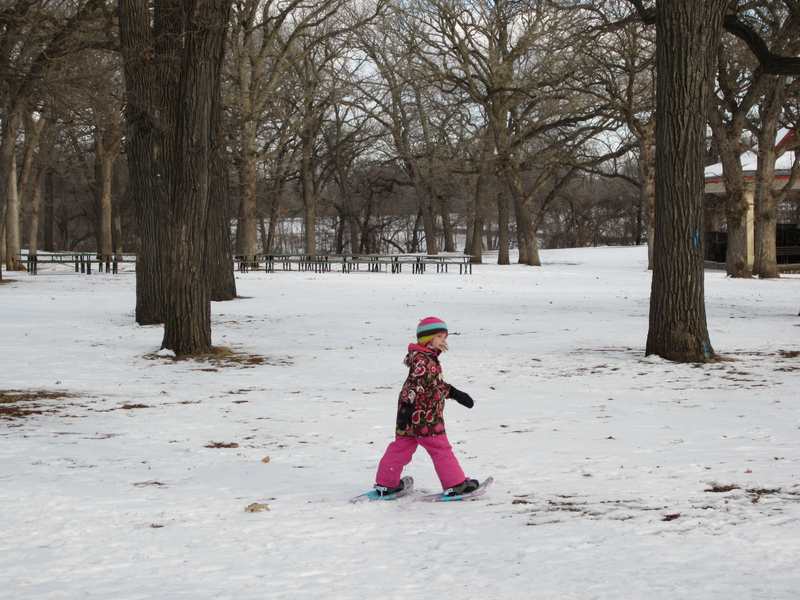 Not only was the sun shining brightly, but our typical January thaw had arrived! For a few days we would get this nice warm weather (you know I’m from Minnesota when I’m calling 40 warm!). Thus, I decided to take advantage of the day and spend as much time outside as possible. 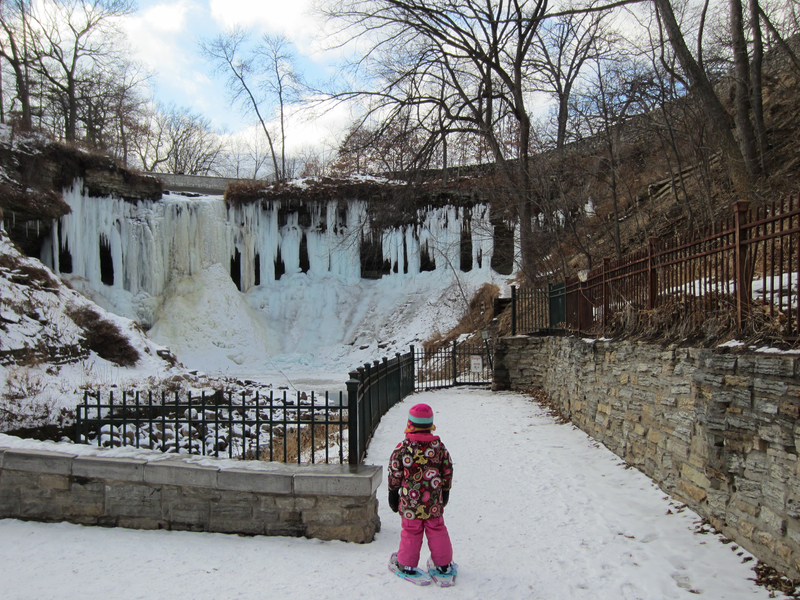 The morning started with a run around the lake and in the afternoon, I took my daughter snowshoeing by the Minnehaha Falls. 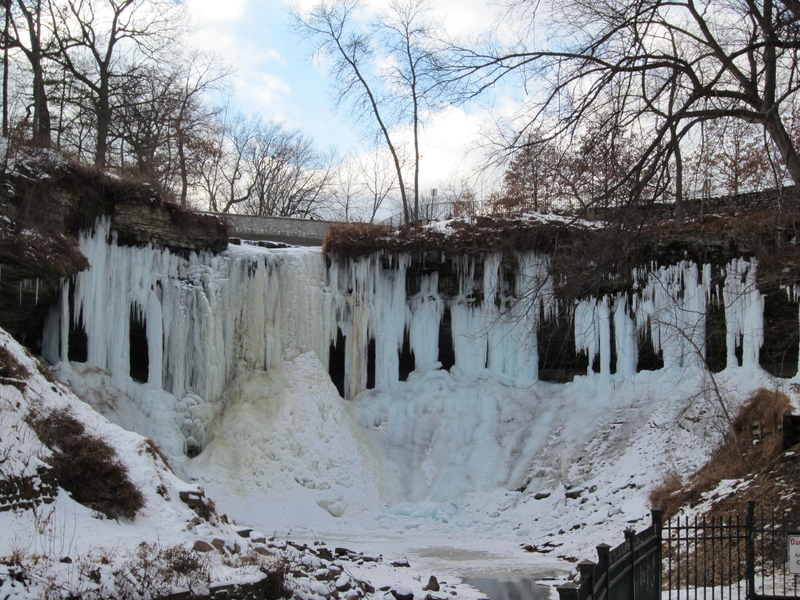 Here are some pictures of what we saw at the falls which freezes into a magical display of ice during the winter. 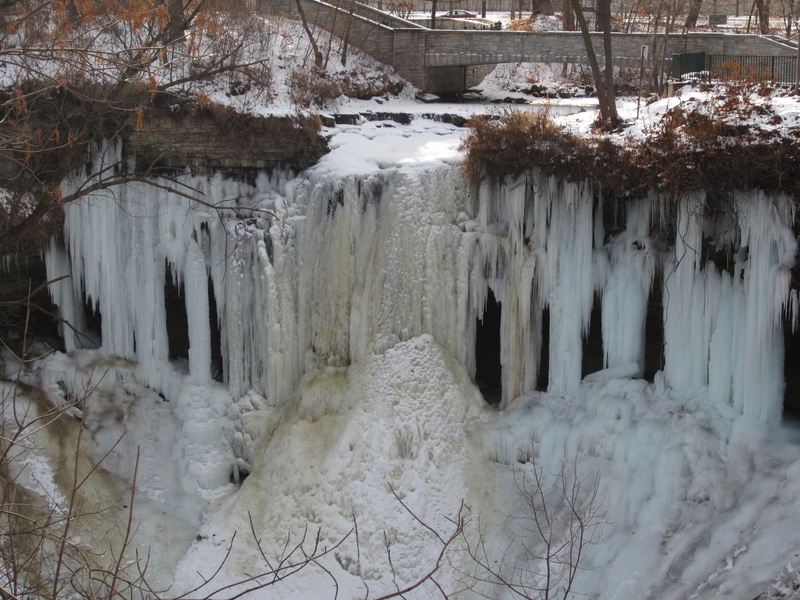 The Minnehaha Creek goes for over 22 miles, starting at Lake Minnetonka where it flows for miles intertwining various suburbs and neighborhoods throughout the city, then splashing over the dramatic Minnehaha Falls and finally ending in the Mississippi River. The “Creek” as we call it, is a fun place to play, run, bike and see nature. Since we’ve lived near it, we’ve been lucky to see a couple of Bald Eagles, a Great Horned Owl, Egrets and Blue Herron and of course many families of ducks. It never ceases to amaze me that we have so much nature in the heart of a city where the airport is not far, people are always around and the rush of a loud motorcycle spoils a nice summer day. Often times I pinch myself to make sure this incredible juxtaposition between nature and city are real. Sometimes it doesn’t seem possible. 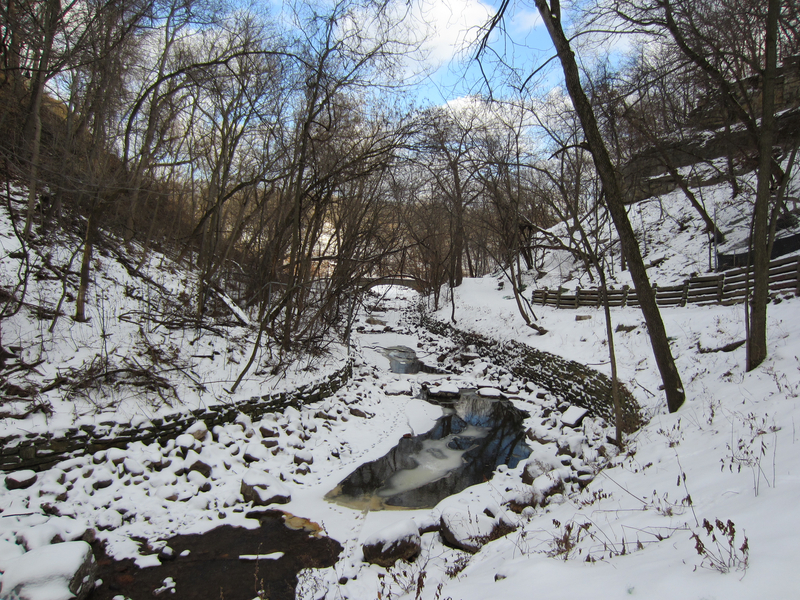 The Minnehaha Creek and Falls is one of our favorite places to bike to in the summer. 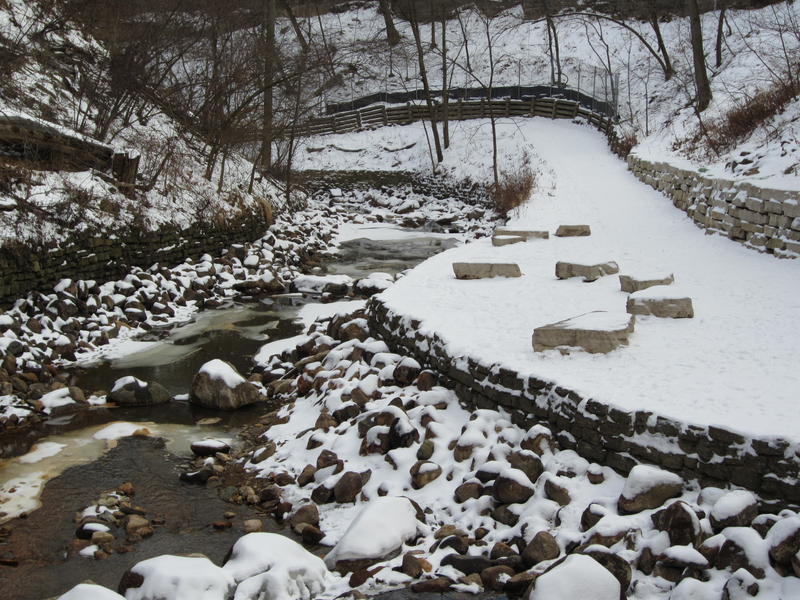 We often take the kids on the beautiful 12-mile bike ride following the creek as it meanders slowly to the falls. 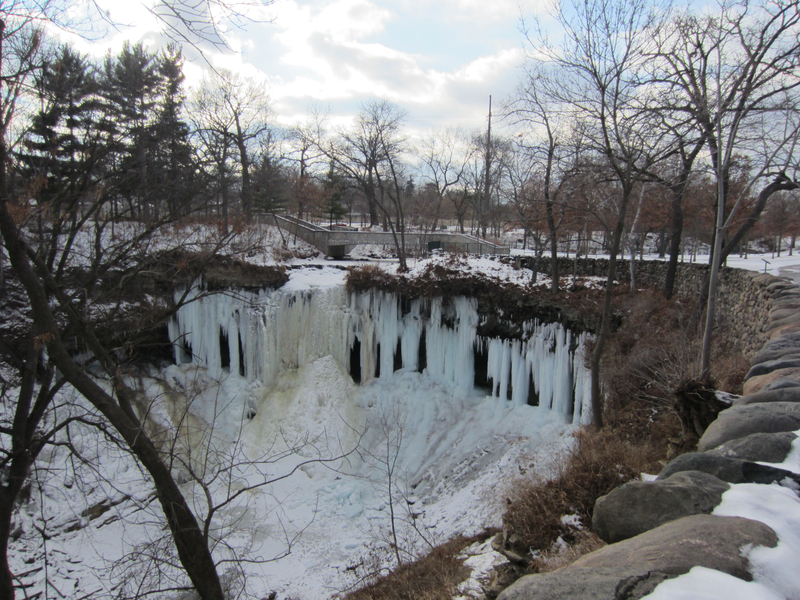 (To read my summer post on biking to the falls, click here: A family bike ride following the Minnehaha Creek). 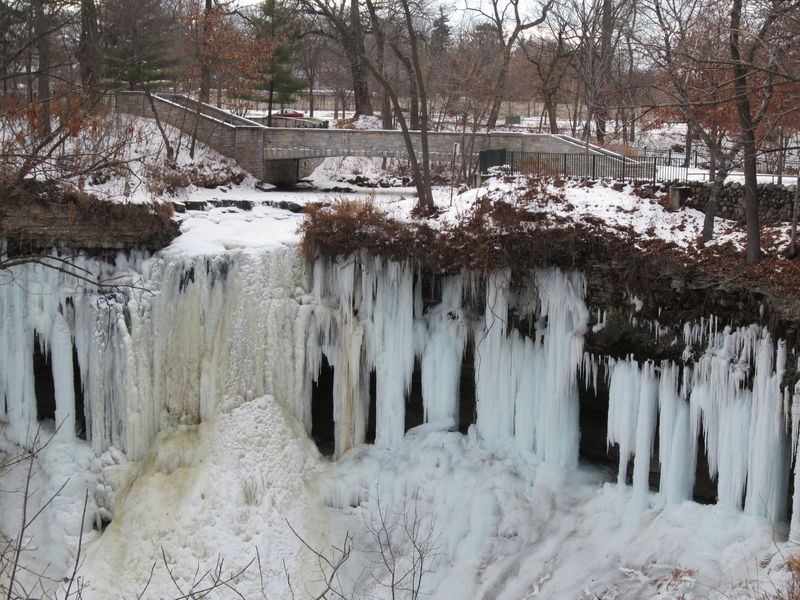 I had heard that the falls was a spectacular sight in the winter but I had never seen it. 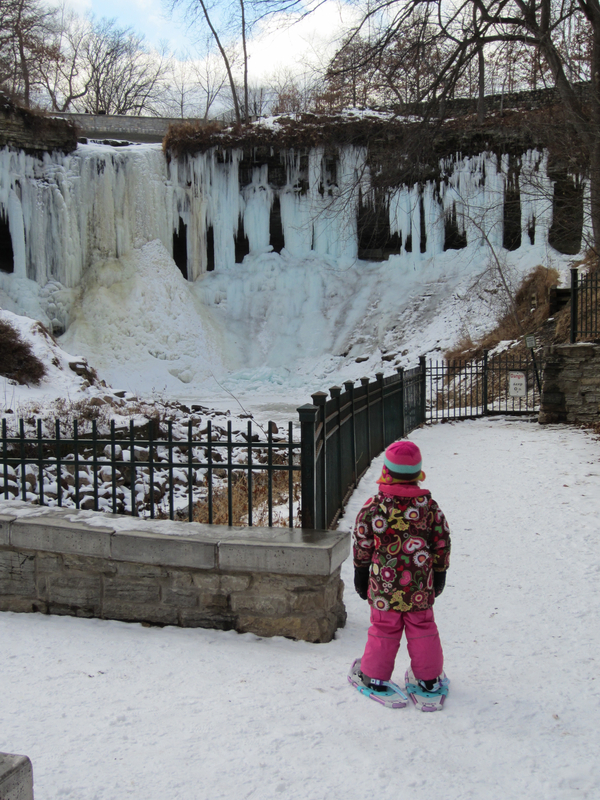 So on a whim, I packed up the snowshoes and drove over to the park with my daughter Sophia in tow and we set out to explore the frozen falls for ourselves. 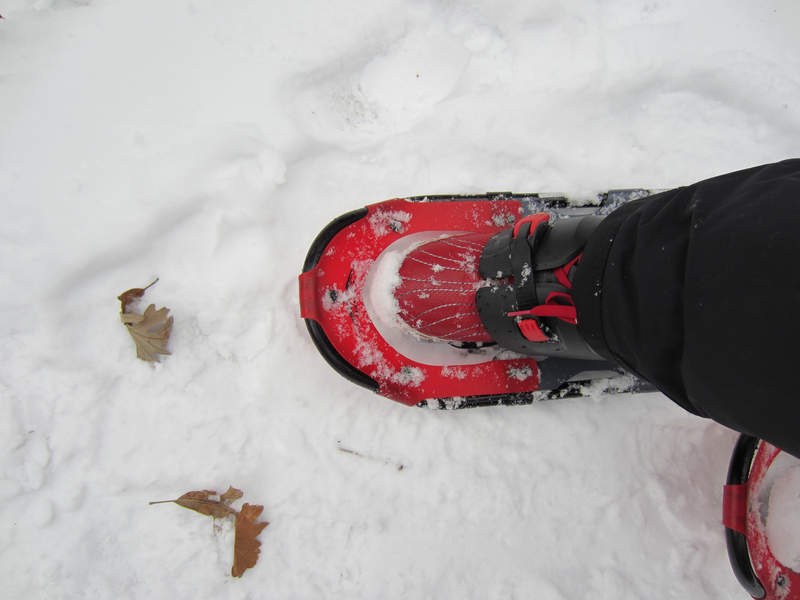 What we found did not disappoint…. 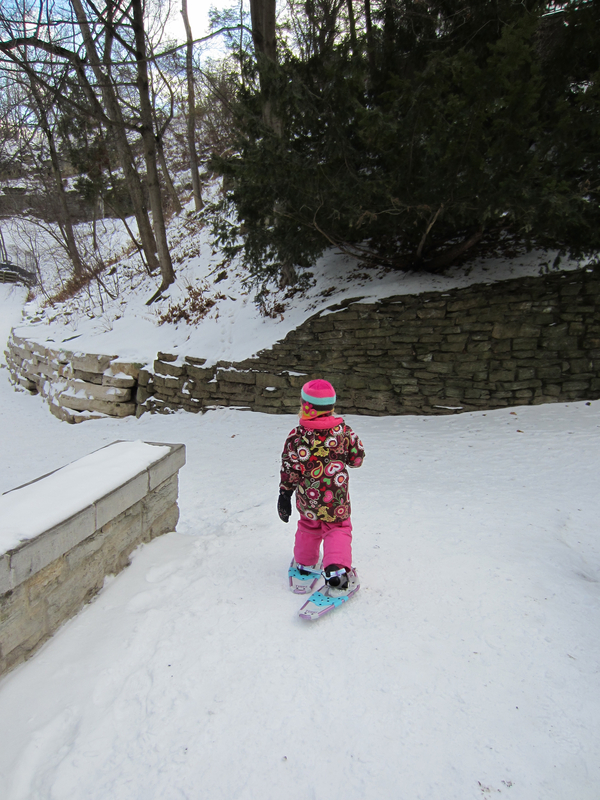 Little five-year-old Sophia heading out to the falls on the starchy, barely there snow (Ahhh….we need more!). Warming my heart with a big smile! 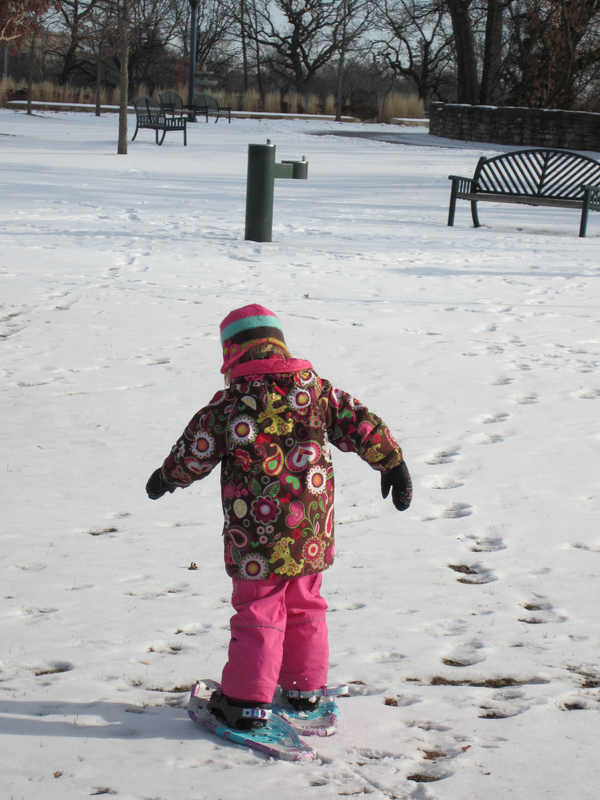 Is it the lack of snow or does she really walk like a penguin on these things? I only wished I had been there in the morning as the sun was rising over the falls and lighting up the ice. This was mid afternoon and it was hard to get a good shot with the sun behind it. I waited until the sun was behind and cloud and took it. As you may be able to see, there is still a trickle of water coming down out of the middle of the falls. It is not completely frozen. Who ever thought ice could be so beautiful? I love this picture! Sophia admiring mother nature. For some reason, I found the tiny ice formations on the creek to be beautiful. It reminds me that there is beauty all around us. All you have to do is look for it. Stay tuned….I am headed out to our nation’s capital on Sunday for the UN Foundation’s Pilot Training program on Shot@Life where I’ll be trained as an advocate on this exciting program that will assist in providing global immunizations. I am so excited! You will be hearing more from me as we plan to meet with and interview the head of the program on Sunday afternoon to learn about her visit to Honduras. If all goes well, that will be my next post. But it may be a few days. Thanks for reading! I’m so jealous. I love the pictures, beautiful falls, happy kiddo, sounds like a perfect day. Thanks for sharing! Great pics. Love the frozen water and your wee one is a cutie! Thanks! It is finally snowing here and I have a cold. Too much over doing it these days! The frozen falls are gorgeous. Have a great trip!